The great epic of the ancient German world was the tale of Siegfried or Sigurd the dragon slayer. 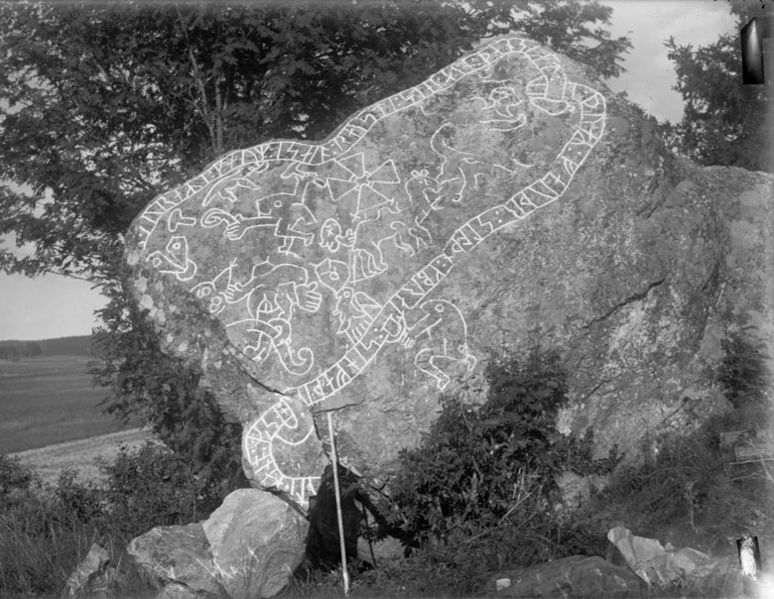 The story survives in two independent versions, the medieval German poem known as the Nibelungenlied and a prose telling from Iceland called The Saga of the Volsungs. The popularity of the story is attested by its many appearances in German art, including the numerous carved “Sigurd Stones” set up in Sweden illustrated with scenes from the hero’s career. I find it strange that both of these versions tell the same story, because that story is a mishmash of two separate, tenuously related tales. 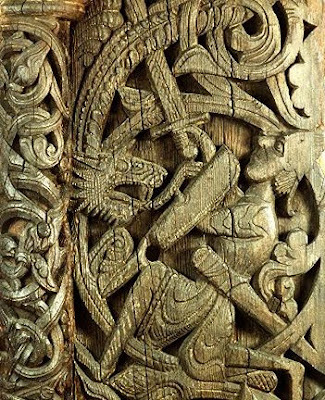 The first describes how the hero slew the dragon Fafnir and acquired a horde of cursed gold – the Norse version also includes the story of Sigurd’s family, the Volsungs, going back several generations – and the second is the story of a band of heroic warriors besieged and eventually killed by the army of Attila the Hun. 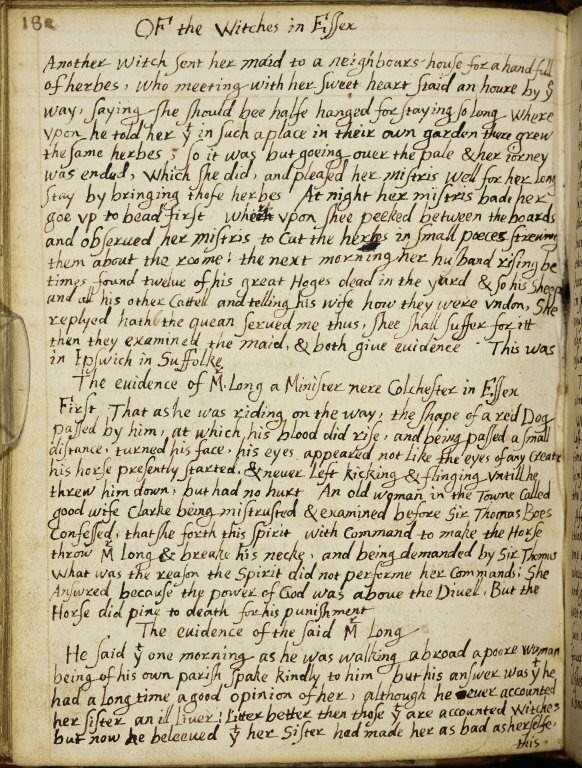 The connection is that Sigurd or Siegfried marries into the family that ends up getting slaughtered by the Huns, but is betrayed and murdered by his brothers in law. They are incited by Brunhild, a woman he promised to marry but then abandoned. Sigurd/Siegfried’s widow then marries Attila the Hun, bringing him and his boundless greed into the story. The story is dark and bloody. Everyone ends up dead, and not for any clear reason. The tale is sometimes taken to be the expression of a gloomy German consciousness, in which fate appears as a doomsday machine crushing all human hopes. It has also been one of the main channels by which ancient Germanic lore was passed down into modern times, and in the form of Wagner’s operas it is the most common way for modern people to encounter the ancient German world. So I assigned the Norse version, The Saga of the Volsungs, in my Celts to Vikings class. This version is shorter than the Nibelungenlied, easier to read, and less Christianized. I had doubts as to how this would work, but it has been great. My students liked the story and enjoyed analyzing what it says about fate and the human condition. They admired the courage of the characters, who are caught up in a tragedy from which they cannot escape but go down fighting instead of whining about their fates or blaming anybody for their troubles. They had interesting things to say about how it compared with the Irish stories we had read, and enjoyed speculating about how Celtic and Germanic culture were different. It was an interesting exercise and fun, and I would do it again. 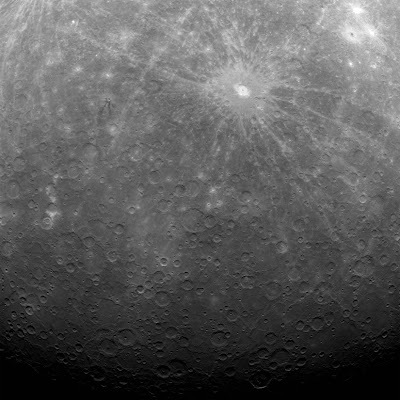 Thanks to NASA's Messenger spacecraft, we now have the first pictures taken from orbit around Mercury -- and they look exactly like every other picture I've ever seen of Mercury. The Muslim Brotherhood, once banned, has been brought into the power structure. . . . It seems increasingly likely that Egypt won’t change as much as many had expected. Moreover, the biggest losers of the revolution are likely to be violent Islamic extremist groups that lose steam when the more moderate Muslim Brotherhood joins the system. “There is a determined effort to stop the revolution in its tracks,” notes Prof. Khaled Fahmy of the American University in Cairo. That’s disappointing for democracy activists like him, but reassuring to those who fear upheaval. . . . 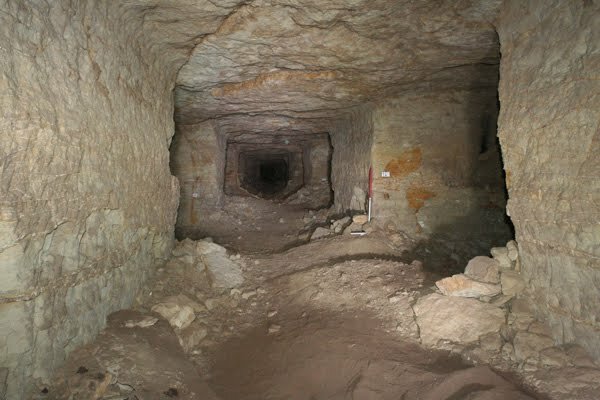 The Dog Catacombs, as they are known, date to 747-730 B.C., and are dedicated to the Anubis, the Egyptians' jackal-headed god of the dead. 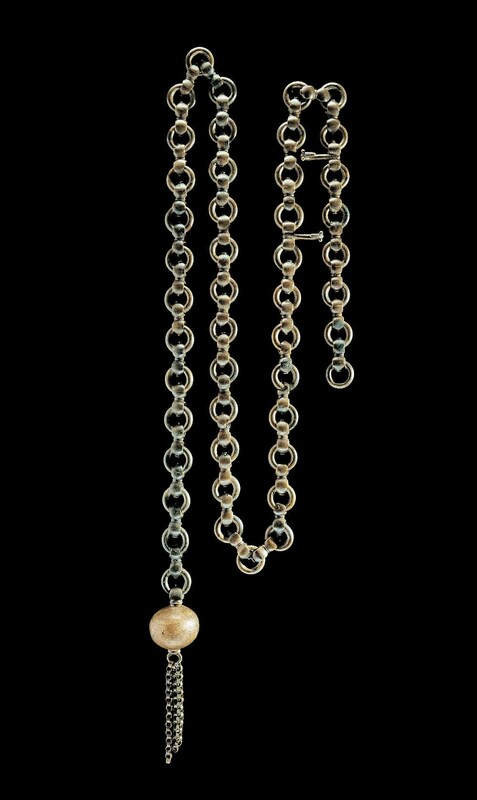 They were first documented in the 19th century; however, they were never fully excavated. A team, led by Paul Nicholson, an archaeologist at Cardiff University in the United Kingdom, is now examining the tunnels and their contents. . . . 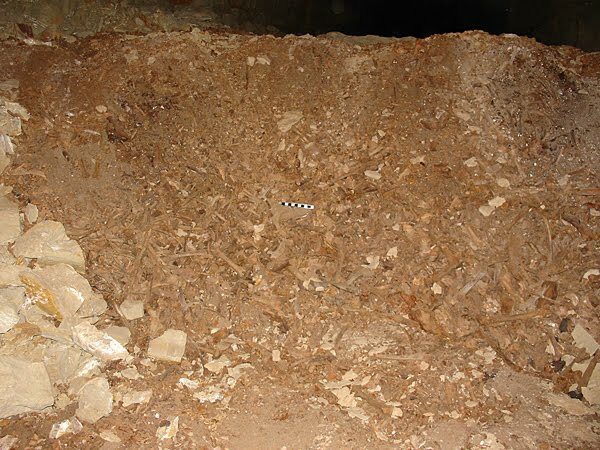 They estimate the catacombs contain the remains of 8 million animals. Given the sheer numbers of animals, it is likely they were bred by the thousands in puppy farms around the ancient Egyptian capital of Memphis, according to the researchers. The Dog Catacombs are located at Saqqara, the burial ground for the ancient capital Memphis. This must have been a profitable business for the priests, who presumably charged the worshippers a little more for each puppy than it cost to raise. What a strange species we are. Last year a collection of about 70 little books, made up of credit-card-sized lead leaves held together by lead rings, surfaced in Israel. Where they came from is disputed, with one set of claimants saying they were recently found in a Jordanian cave, while a Israeli Bedouin says they have been in his family for a century. Meanwhile, Israeli scholars have started to examine them, trying to figure out what they are. 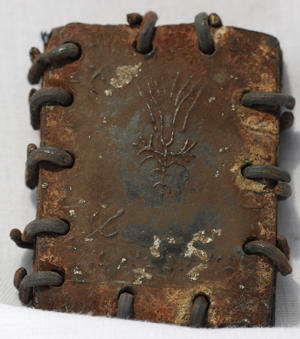 They are written in Hebrew letters, but the language is obscure and much of it may be code. The symbol of the menorah is prominent, but what that means is disputed, because orthodox Jews of the time did not depict that holy object. One of the texts may contain a reference to the Messiah. 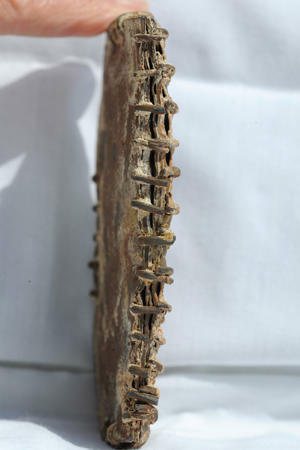 Initial tests on the lead suggest it is around 2000 years old. This is very intriguing, to be sure, although the whole business smells like a fake to me. It is not difficult to fake weathering with chemicals, and the dating of old lead is hardly an exact science. I am withholding judgment until I see more data. Meanwhile, though, the web is humming with speculation that somewhere in these lead tablets is the Truth About Jesus. 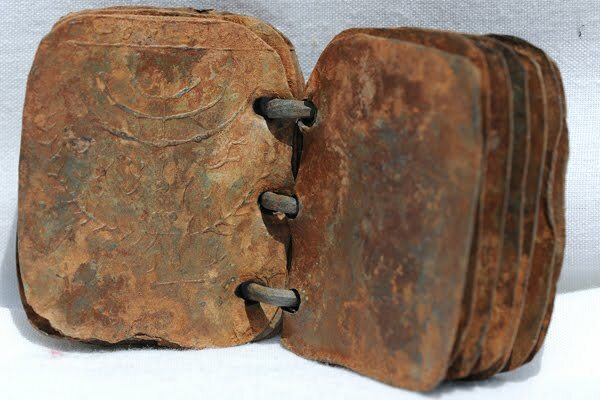 Not that we even know these are Christian texts, and if they are they could well date to centuries after Jesus' time, so there really isn't any reason to hope they will tell use something new about Jesus. But the hunger for texts that will somehow get us closer to Jesus and his apostles is so great that it fills any convenient void with longing. A "scholar" named David Elkington has called this "the major discovery of Christian history," which is pretty big leap considering that we don't even know that the texts have anything to do with Christian history. The first translated sentence to emerge was "I shall walk uprightly," which some people immediately interpreted as a reference to the resurrection; sounds like a perfectly ordinary bit of the Old Testament to me. All Jewish sects of the time had a great interest in the Messiah. So I say, relax, and enjoy these as an intellectual puzzle that may turn out to shed some light on Jewish history in the first centuries AD. I find this list very strange -- are they trying to say there were never cowboys in America? and wasn't the Marlboro Man a real rancher from Wyoming? -- but this is certainly an amusing game to play at. Via Tyler Cowen, a list of research principles from a mental health group at the University of London. And yet, despite all the challenges, it is still worth attempting to encourage an evidence-based approach, since the alternative is to continue to develop practice based only on assumption and belief. David Eddy, MD, PhD, a healthcare economist, says the problem with American medicine "that physicians don't know what they're doing." Many clinical decisions made by physicians appear to be arbitrary, uncertain and variable. Reams of research point to the same finding: physicians looking at the same thing will disagree with each other, or even with themselves, from 10 percent to 50 percent of the time during virtually every aspect of the medical-care process—from taking a medical history to doing a physical examination, reading a laboratory test, performing a pathological diagnosis and recommending a treatment. Physician judgment is highly variable. Here is what Eddy has found in his research. Give a group of cardiologists high-quality coronary angiograms (a type of radiograph or x-ray) of typical patients and they will disagree about the diagnosis for about half of the patients. They will disagree with themselves on two successive readings of the same angiograms up to one-third of the time. Ask a group of experts to estimate the effect of colon-cancer screening on colon-cancer mortality and answers will range from five percent to 95 percent. . . .
Give surgeons a written description of a surgical problem, and half of the group will recommend surgery, while the other half will not. Survey them again two years later and as many as 40 percent of the same surgeons will disagree with their previous opinions and change their recommendations. Research studies back up all of these findings, according to Eddy. . . .
And yet as I write Republicans in Congress are trying to eliminate funding for developing medical best practice guidelines. I just encountered this "law" in the context of education reform, because it seems that the more stress you put on test results, the more cheating you get. Or, more broadly, the more you stress test results, the more effort people put into getting higher scores by any means necessary rather than on teaching whatever the test is supposed to measure. This doesn't mean that the purpose of standardized testing will always be defeated, it just means you have to work very hard to develop good tests and monitor the results for cheating. This remarkable, 525-million-year-old fossil from China preserves the soft parts of a kind of tube worm, of which usually only the hard tube survives. These worms are called "pterobranch hemichordates" and it is speculated that the central spine and nerve tube that defines our phylum, the Chordates, may have evolved from a structure like the central spine of this animal. How, exactly, are radical Islamists supposed to dominate a secular atheist country? Much of our public discourse depends on economic statistics -- unemployment is up this much or down that much, GDP is up this much or down this much -- and we throw these numbers around as if they were read off highly accurate meters. But they are not; they are generated by teams of government economists based on surveys of varying degrees of accuracy and formulas that are in some cases very controversial. While I am not sure that statistics really drive government action as much the press seems to claim (I think politicians often use statistics as excuses to do what they wanted to do anyway), they surely have some impact. It is therefore salutary to be reminded, from time to time, of how questionable our economic statistics really are. Consider the claim that during 2007-2009 recession US productivity grew at the impressive annual rate of 2.4%. I have seen this number dozens of times in the Times, the Post, and elsewhere, usually accompanied by some notion of the "underlying health" of the economy. But take a look at this long analysis of that one number by Michael Mandel. At the very least, some of the numbers that went into the calculation of this value are highly suspect. (For example, who can believe that over this two-year period productivity in US mining grew by 23%?) By Mandel's calculation, there was no US productivity growth at all in this period; any "productivity" gains really came from more efficient offshoring, for example shifting from cheap Taiwanese suppliers to even cheaper Vietnamese suppliers. Now Mandel is grinding a personal ax here, which is his argument that our economy is doomed to long-term stagnation by a decline in economically useful innovation. His calculation reinforces this view. But after reading this analysis it is hard to take the government's numbers seriously, and the whole public discourse based on them is revealed as so much hot air. I was most struck by the last few minutes of the speech, when Obama sought to put the Libyan intervention in the context of the regional Arab uprising. He firmly embraced the forces of change, saying that history is on their side, not on the side of the oppressors. In doing so he deftly evoked two moments in our own history-first, explicitly, the American Revolution, and second, more slyly, abolitionism, with a reference to "the North Star," which happened to be the name of Frederick Douglass's newspaper. Obama is a cautious political actor who rarely says anything radical, but it seems that he has in his heart less tolerance for dictators of any sort than any President since Jimmy Carter. Whether this will amount to much in terms of his policies remains to be seen. Strange to say, this is actually the clearest and most sensible summary of the situation I have yet read. To be blunt, we went down that road in Iraq. Regime change there took eight years, thousands of American and Iraqi lives, and nearly $1 trillion. That is not something we can afford to repeat in Libya. Ok. But if we are not trying to remove Qaddafi, what are we trying to do? Bomb him to the negotiating table? Divide the country? I have to say that I really just don't get it. As I was saying about the possible pre-Clovis finds at the Friedkin Site, the biggest problem with all of the possible pre-Clovis sites is that once you accept any of them it is hard to avoid accepting a lot of them, and together they make no sense. At the Lovewell Site in Kansas, paleontologists excavated a bunch of mammoth bones that date to 22,000 years ago, and they are now claiming that the bones could only have been broken by people smashing them with rocks. Beats me, I mean, I don't know anything about elephant bones. But if there were humans in Kansas 22,000 years ago, how did they get there, and where did they go? Even if you add together all of the remotely plausible pre-Clovis sites you get a very, very thin record. The 9,000 years between Lovewell and the population explosion of Clovis times is a long time; by 9,000 years after Clovis, North America was so densely populated that every decent camping spot is covered by thousands of artifacts. And, remember, the genetic evidence points to a single small source population that left Asia around 15,000 years ago. If you want the first Americans to have arrived 22,000 years ago, you have to throw out the genetic evidence or postulate that a few hundred Clovis migrants somehow completely exterminated all those who were here before them. And then you have to assume that there are thousands of pre-Clovis sites all over the Americas that have been misidentified or not yet found. This is possible, especially if the hypothetical pre-Clovis people did not use any "diagnostic" artifacts that identify their collections. 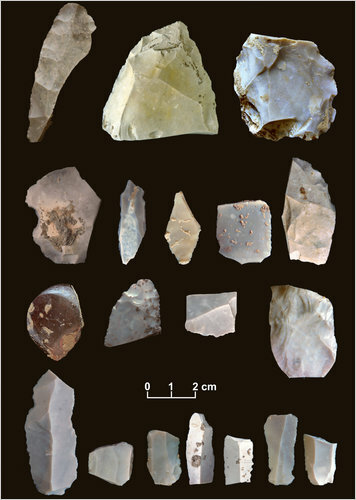 After all, most Clovis sites can only be identified as such by the presence of Clovis spear points. Still, it starts to be a stretch. Actually there is another reason to doubt the Lovewell finds, which is that no stone tools of any sort were found around them. Stone Age people were very messy, and as they butchered large animals they tended to break or wear out a lot of stone tools, which they then resharpened on the spot. So at known mammoth and buffalo kill sites from Clovis and later times there are always at least a few stone artifacts. But Michael Waters is a fan, on the theory, I suppose, that if his site is pre-Clovis there must be lots of other pre-Clovis sites, so the more the merrier. So I doubt the Lovewell claims will be much talked about a decade from now. I mention them because they illustrate the point I was trying to make about pre-Clovis archaeology. It is possible to reconcile finds from a thousand years or so before Clovis with a coherent story of human expansion and adaptation, and with the genetic evidence. But possible pre-Clovis sites seem to be randomly distributed in time, going back 30,000 years and more, and I simply cannot understand by what model humans could have been in North America for that long. Portuguese architect Eduardo Souto de Moura has won the Pritzker Prize. Souto de Moura is not known for any particular blockbuster work, but for a long series of houses and small public buildings, mostly in Portugal. 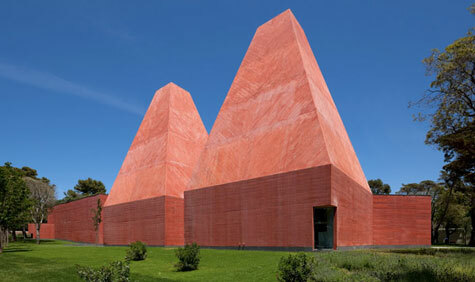 Above are two images of the Casa das Histórias, a small museum near Lisbon (slide show here). I find this exterior interesting, but the interior seems to be very plain and stark. 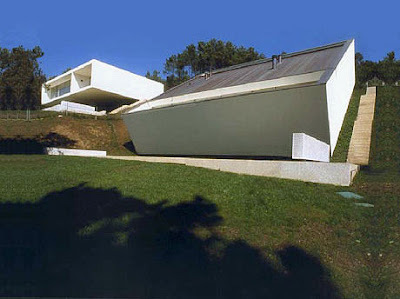 These house look like copybook modernism to me. This is the municipal stadium in Braga, which looks pretty nice as stadiums go. 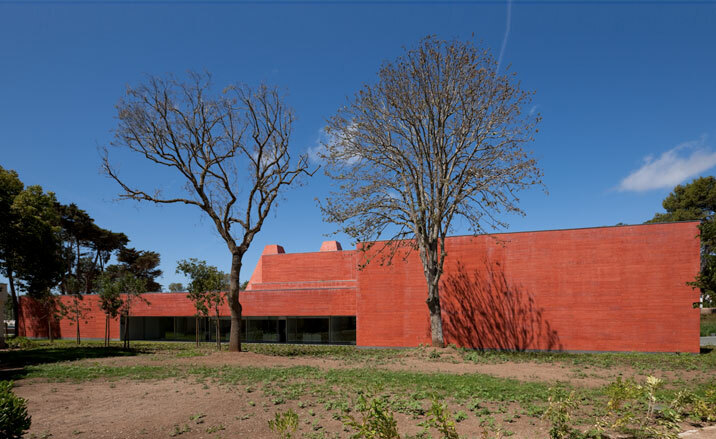 This is an interesting project, the conversion of a Cistercian convent into a modern hotel, and seems sensitively handled. I like to see prominent architects work on this kind of reconstruction, rather than insisting on their own vision from start to finish. We ought to be taking more of the world as we find it, rather than trying to remake it all the time. 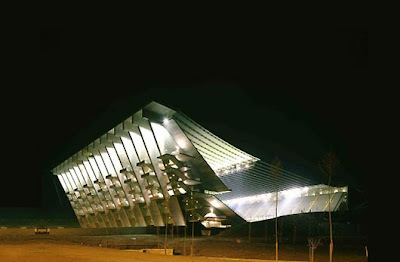 This tower is pretty ho-hum, too, although I have seen much worse. Overall I see the mastery of the modernist form that I suppose the Pritzker committee wanted to honor, but nothing that moves me very much. The U.S. military dramatically stepped up its assault on Libyan government ground forces this weekend, launching its first attacks with AC-130 flying gunships and A-10 attack aircraft, which are designed to strike enemy ground troops and supply convoys, according to senior U.S. military officials. Their use, during several days of heavy fighting in which the momentum seemed to swing in favor of the rebels, demonstrated how allied military forces have been drawn deeper into the chaotic fight in Libya. A mission that initially seemed to revolve around establishing a no-fly zone has become focused on halting advances by ground forces in and around Libya’s key coastal cities. I think it would be rather silly now to pretend that we are not trying to help the rebels oust Qaddafi from power. Even though I know manufacturing is not really declining in America, and though I understand that a cycle of creation and destruction is a big part of how capitalism makes us rich, the sight of a great abandoned factory still gives me melancholy thoughts of loss and decay. This is the old Chrysler plant in Newark, Delaware. 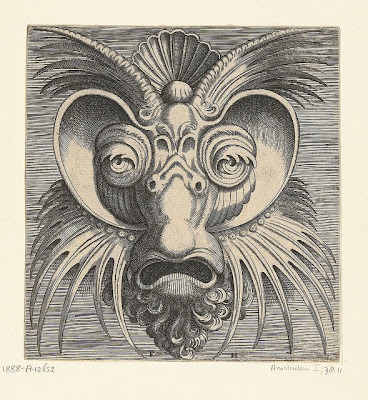 These most fabulous grotesque masks come from a suite of about twenty two prints designed by Cornelis Floris, engraved by Frans Huys and published in Antwerp in 1555 by Hans Liefrinck. 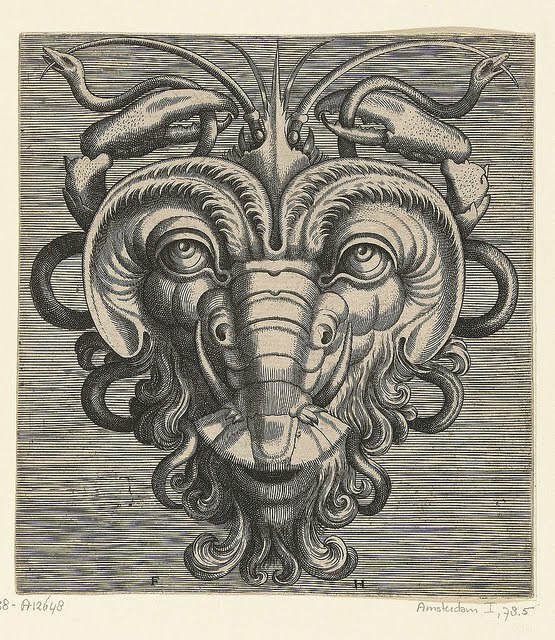 The late Baroque / early Mannerist designs incorporate an abstracted zoological motif, in most cases relating to the ocean, within an auricular ('ear-like') ornamental style. Auricular describes the smooth, curved, rippling and pliable shapes that resemble a human ear. 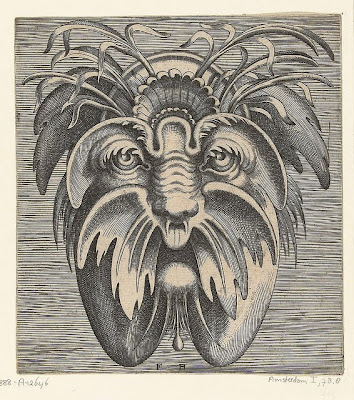 The prints here are very early examples of this type of ornament which was developed by goldsmiths attempting to demonstrate organic forms extruding from the surface. The style probably influenced the later Rococo and Art Nouveau movements. Whoever says he’s 100% right is a fanatic, a thug, and the worst kind of rascal. 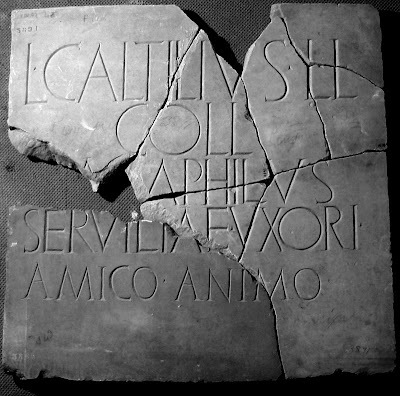 Lucius Catilius Pamphilus, freedman of Lucius, member of the Collinian tribe, for his wife Servilia, in a loving spirit. The museum has now put the puzzle back together, and thus husband and wife are reunited after centuries apart. I can only see this as an attempt to re-assert traditional social norms despite political revolution. The ritualistic shaming of women who participate in street demonstrations, and their equation with prostitutes, is a crude attempt to force them from the public space and back into the home. Libyan rebels have dramatically reversed their fortunes in the past two days, capturing first the city of Ajdabiya and then two oil towns, Ras Lanuf and Bin Jawwad. This represents an advance of at least 200 miles (320 kilometers) since the bombing began. According to fighters interviewed in Benghazi, they met little resistance. Qaddafi's men probably did not want to fight with that one long, exposed coastal road behind them, so they pulled back -- unless they were so frazzled by their first encounter with modern air power that they just took to their heels. According to the Times, the rebels are expecting a major showdown battle at Surt, Qaddafi's home town. This could certainly turn out to be interesting. I never thought bombing would overthrow Milosevic, but in the end it did. So maybe it will overthrow Qaddafi as well. Still, Qaddafi's men had the toughness to launch their nearly successful counter-offensive in the first place, so they may turn out to have a lot of fight in them yet. The chief god of the ancient Germans and the pagan Norse was Wotan or Odin. 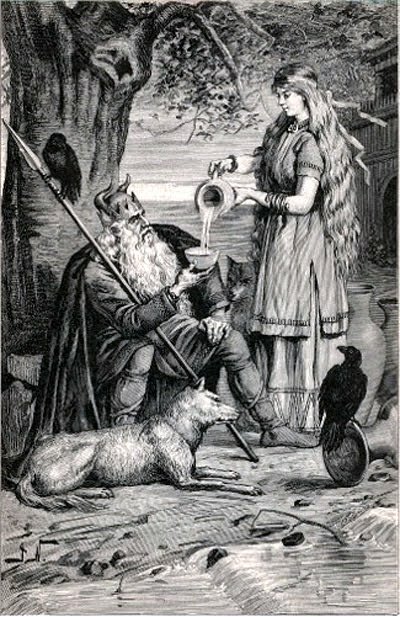 Odin was a strange sort of god. He was not the god of the sky or thunder or the sun or the wind; he was not invoked for better crops, better health, or success in business. He decided the outcome of battles but he was not a war god; he was much involved in death but was not the god of the underworld. 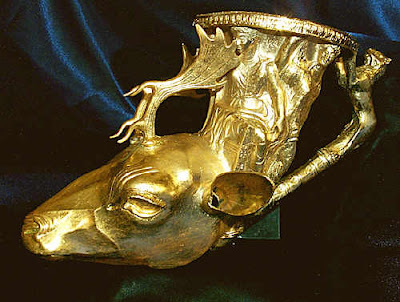 He was the god of kings and gave them their power, and his closest comparisons among other Indo-European gods are those associated with sovereignty. Yet he is not much like Mitra or Varuna, either. One thing we know about Odin is that he received human sacrifices. His victims were often hanged from trees, about which more later. 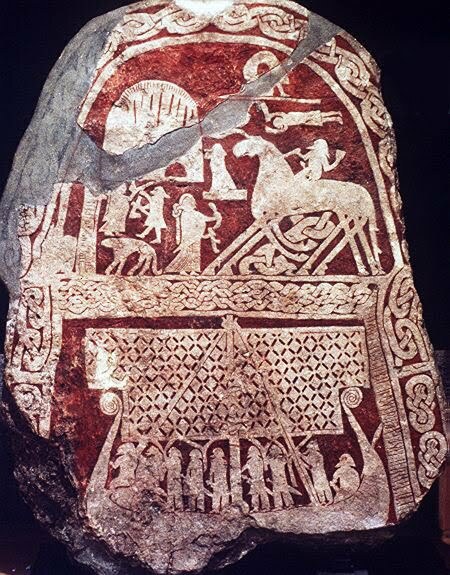 This carving on a Viking age stone from Gotland seems to show two sacrifices, one that may be a child, laid out on a stone for slaughter, and a warrior with shield who has been hung from a bent tree; when the tree is released it will lift him into the air and strangle him. Over them hovers the interlaced triple triangle of the Valknut, or dead man's knot, which is a symbol of Odin and probably indicates that the sacrifices are for him. Odin made sacrifices of his own. 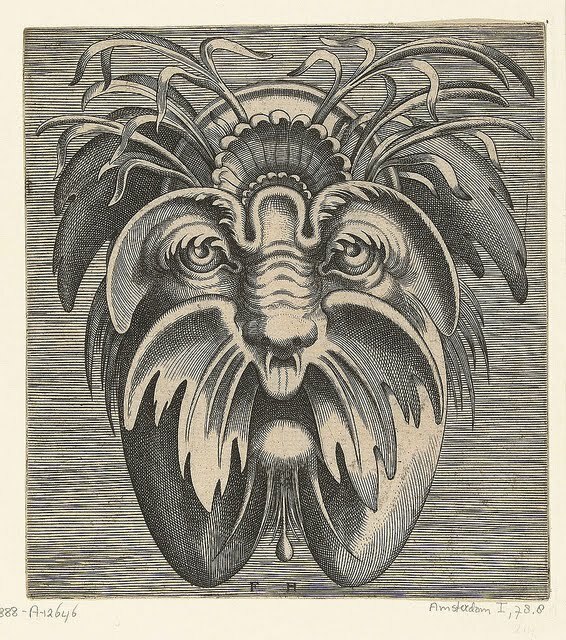 For one drink from the spring that flows forth at the foot of Yggdrasil he gave up one of his eyes, but the water from that sacred spring gave him great wisdom. He was called the Far-Seeing, and the All-Knowing. His companions were ravens, which are emblems of both wisdom and slaughter, another connection between Odin's sovereignty and the land of the dead. What kind of god acquires his wisdom by hanging for nine nights on a tree? A shaman god. Odin, in the stories that come down to us, acts much like a shaman, specifically a Siberian or Lapp shaman. 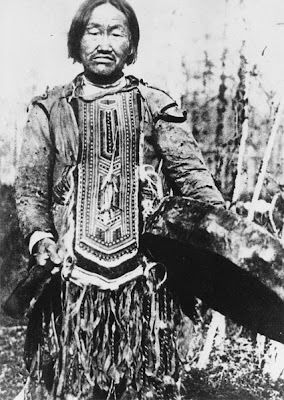 Shamans, the most ancient human religious practitioners, enter into a trance state in which their spirits leave their bodies to journey through other planes or realms; often the place they visit is imagined as the realm of the dead. From their journeys they bring back knowledge, especially knowledge of the future or of how to cure diseases. Shamanic lore is woven all through Norse myth, from Freya’s cloak of feathers to Odin’s eight-legged steed -- both were conveyances used by shamans in their spirit journeys. The Norse cosmos was centered on a great ash tree, Yggdrasil, whose roots and branches connected the nine worlds where humans, gods, giants and others lived. This is the cosmos of the Siberian shamans, and they imagined themselves climbing up the world tree as they entered the spirit realm. 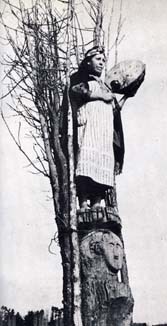 Sometimes they climbed trees or wooden poles as part of their rituals. They called these trees their spirit horses. Yggdrasil means “the steed of Odin,” so the axis of the world as the Norse saw it was the pole their shaman god climbed to reach knowledge. Here is the connection between Odin and all-knowing and Odin the god of death, for like a shaman he must travel the spirit road to acquire his wisdom. Shamanic ecstacy was widely seen as a sort of temporary madness, and the overall sanity of its practitioners was suspect. This notion carried over into other forms of ecstasy, for example in the tradition that makes poetic inspiration a kind of madness. This is why Odin, the shaman, is the patron of poets and berserks – all forms of ecstasy fall under his purview. The worldview of the Siberian shamans was not optimistic. They believed that most or all of life was governed by impersonal forces beyond the control even of gods, and the that the shaman’s main role was to discover what fate those forces had decreed. Sometimes, by heroic effort, a shaman could avert an illness or discover that some catastrophe had been sent by an angry god who might be placated. Mainly, though, they were discoverer, not shapers. Death meant passage to a shadowy realm where spirits had even less freedom than living humans. The gods themselves would in the end be defeated and destroyed, their doom already decreed. 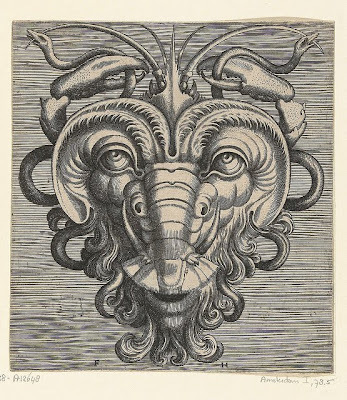 So far as we can tell, the ancient Germans had a similarly gloomy cosmology. Into Valhalla, the Hall of the Slain, Odin gathered dead heroes and feasted them so that they would fight for him in the last battle. This was the best sort of afterlife the Norse could imagine, and we hear little in their legends about the fate of dead farmers or housewives. But the afterlife of the heroes was shadowed by the end they knew was coming: Ragnarök, when Fenris the Great Wolf would snap his chains and swallow the sun, the gods would be overwhelmed by monsters and demons, and the dead heroes would meet their final end. 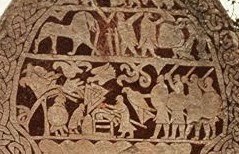 Perhaps, though, some of the tales hint, the world would then be remade, and perhaps that future world would be better than the violent, cruel world of the Viking age. As more and more gold treasure comes from the ground in Bulgaria, buried in the tombs of Thracian kings and nobles in the third and fourth centuries BC, it is hard to keep up with these spectacular discoveries. This web site has a spectacular collection of photographs. 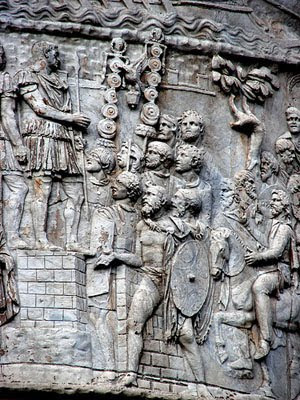 On Monday we started our unit on the ancient Germans with the traditional text, Tacitus’ Germania. Even though this must be one of the most widely assigned of ancient texts, it raises some problems. In writing it, Tacitus was not much interested in the Germanic tribesmen themselves. His main purpose was to comment on the mores of his fellow Romans by contrasting them with the barbarians; for example, he devotes a long paragraph to how greatly the Germans detested adultery, by way of complaining about sexual license among the Romans. Since we have a hard time figuring out how much adultery there is in our own society, I find it unlikely that Tacitus really knew how much there was among the German tribes. 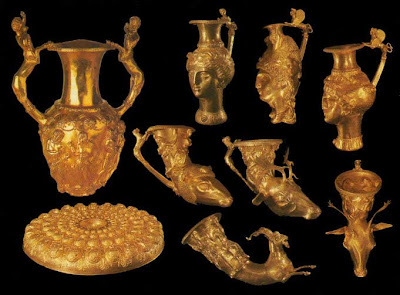 He also says the Germans did not value gold and silver, which has been disproved by numerous finds of gold and silver objects in German graves. Surely Tacitus only included this passage to attack the greed of the Romans. The young men are slow to mate, and their virility is not thus exhausted. Nor are maidens rushed into marriage. As fully grown as the men, they match their mates in age and strength, and their children reflect the strength of their parents. Pseudo-biology aside, this is an accurate picture of the ancient marriage pattern in northern Europe. As far back as we can find any evidence, northern Europeans typically married in their 20s, and the men and women were roughly the same age. Their marriages were much more equal, both legally and in practice, than those of the Mediterranean world, where girls just past puberty were commonly wedded to men ten or even twenty years older. Tacitus seems not to have grasped the difference this made for relations between the sexes, but he got the basic facts right. So the Germania remains the best available primary source for introducing the Germans, and its complexity can even be a plus for an advanced class like the one I am teaching now, challenging the students to tease out the threads of genuine ethnography and social criticism. Buttermilk Creek, the Biomantle, and "Unequivocal Proof"
This morning, when I read news accounts of the new Science article from Waters et al. and put them together with what I had already heard about the Buttermilk Creek Complex, it sounded to me like the Debra L. Friedkin Site was pretty good candidate for a pre-Clovis archaeological site. Now that I have seen the article and talked to some friends about it, I am a lot less impressed. The site may still turn out to be very early and very important, but there are big questions to be answered. 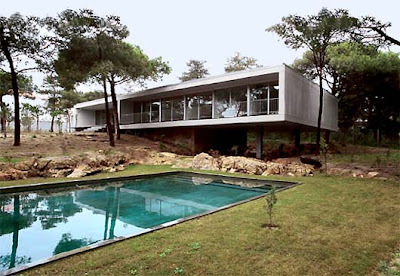 The biggest are about the integrity of the site and its dating. What follows is going to be technical, because I think these issues are important for archaeology and science in general. 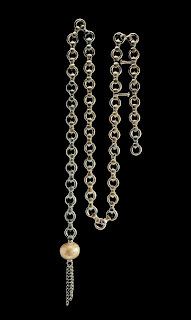 used grains of quartz from the lower layer as tiny clocks. Electrons within these grains accumulate in "traps" inside the molecular structure at a steady, clocklike rate, explains Steven L. Forman, a geochronology specialist on the team and a professor at the University of Illinois at Chicago. Light releases them, so the accumulation indicates how long it has been since the grains last saw the light of day. Scientists measure that electron accumulation by exposing the grains to light in a lab, releasing the particles. In this case, Mr. Forman says, the number of escapees indicated the grains had been buried with the tools between 13,200 and 15,500 years ago, give or take a margin of error of about 1000 years. To start with, 1000 years is a pretty big margin of error, and there are good reasons to suspect that the real margins of error for this data are even bigger. OSL dating is affected by the environmental conditions of the sample, including temperature and humidity. It so happens that the period between 15,000 years ago, the alleged age of the site, and 11,000 years ago was an era of dramatic fluctuations in temperature and humidity. Radiocarbon dating, which is much less affected by these conditions, is thrown off by hundreds of years in this period, and it has taken us decades of study with many sorts of dating (tree rings, ice layers, varves) to work out even an approximate translation of radiocarbon years into calendar years for this period. Surely it will be much more difficult to work out accurate translations of OSL years, and we have much, much less experience with this technique. Click on the image above and you will get a clue as to how far off these dates might be. The date from the Clovis layer (14,350 ± 910) is at least a thousand years too early, suggesting that the whole sequence should be pushed a millennium closer to the present. Even more important are reservations about the stratigraphic integrity of the site, and the excavators' understanding of how artifacts move through the soil. Yes, artifacts move around in the soil. I have seen sites where stone flakes had sunk a meter down through sandy soil in just 4,000 years. 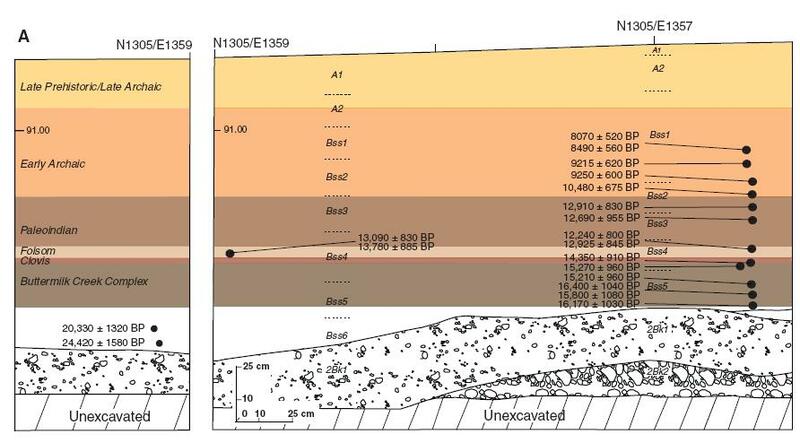 If you look at the data from Buttermilk Creek Complex, you see that the number of artifacts in each centimeter of their pre-Clovis layer declines steadily with depth, a pattern most often produced when the artifacts are drifting down from a layer above. This soil is clay, so artifacts will move less than they would through sand, but they will still move. Even Tom Dillehay, excavator of the controversial Monte Verde Site and usually a defender of pre-Clovis claims, expressed doubts about the integrity of the Friedkin Site. 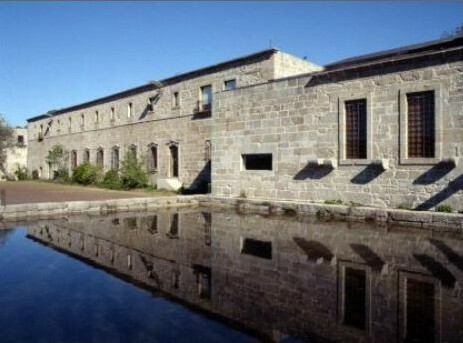 He noted that "the ecological conditions at the site, including rain-swept mud and remnants of creek flooding" could have displaced the artifacts. Crack infills constitute a minor portion of the soil volume with diameters rapidly decreasing from 2 cm near the surface to less than 1 cm at a depth of 1 m. Soil material between the crack infills is intact with few rodent burrows and limited root penetration (less than 2mm diameter). Only a few cracks reach the Clovis and Buttermilk Creek Complex levels, and crack apertures are less than 1 mm diameter, smaller than the microdebitage sizes from these levels. But artifacts don't generally move through the soil by falling down cracks. They move because of the constant churning of the soil by earthworms, ants, roots, and other biological agents. The top foot or so (30 cm) of any temperate soil is the "biomantle," a zone that is in constant motion. At my old house I made a path by placing large pieces of slate on the ground surface, and five years later when we moved these slates had already disappeared beneath the sod, having sunk more than 5 centimeters (2 inches) down into the ground. I assure my readers that there were no cracks under the slates large enough for them to fall into. Perhaps you are thinking, yes, but that is at the surface, and the Buttermilk Creek artifacts are more than a meter below the surface. True, but they were not always a meter below the surface; to judge from the stratigraphy, they were within 20 cm of the surface for at least a thousand years. As my example shows, stones can move several centimeters in just five years, so that thousand years is plenty of time for the Buttermilk Complex material to move 20 cm down from the Clovis layer. If you are now thinking that my line of argument would invalidate the whole concept of stratigraphy on which archaeology rests, well, it does -- at least as an absolute rule. One should never assume that any one artifact is in the stratum where it was first deposited, and strata are more often distinguished statistically, by changes in the ratios of artifact types, than by absolute differences. I am not arguing that the Buttermilk Complex material did drift down from the Clovis layer, only that it might have. Why would I insist on that? Well, some of my acquaintances assert that the collection from the Friedkin Site looks very much like the material from the Aubrey Site, a site in central Texas that dates to the Clovis period. Why do the alleged pre-Clovis artifacts at Buttermilk Creek look so much like Clovis artifacts? 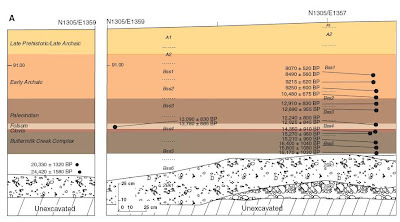 The Friedkin Site is only 250 meters from the Gault Site, a major Clovis Site that has the distinction of producing the oldest widely accepted radiocarbon date from a Clovis Site. 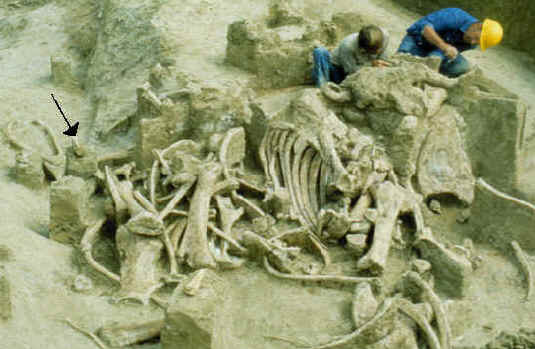 Because of this, and some other technical considerations, one theory about Clovis is that it developed in Texas among settlers who crossed from Asia and then kept moving south until they found somewhere warm to rest for a while. Since the Clovis culture seems to have developed in North American, the very first people here did not have it. It may turn out that the Friedkin Site is "pre-Clovis" in this sense, or perhaps proto-Clovis. But I very much doubt it will turn out to be 15,500 years old. Clovis First is what scientists sometimes call a "robust" theory, meaning it fits with a large amount of data from many sources and has great explanatory power. The first non-archaeological evidence of humans in the Americas dates to Clovis times (13,300 to 12,900 years ago), including mass extinctions of animals, an increase in the number of fires, and other ecological factors. Clovis people acted like we expect humans to act on a new continent: they spread very rapidly and their numbers grew exponentially, carrying a nearly identical material culture across thousands of miles; they destroyed numerous animal species and otherwise reshaped the environment; they then began to diversify, and subsequent cultures in different parts of the continent become more and more distinct over time. The model was developed without any understanding of the rate of genetic change, and in fact early attempts to date the break between American and Asian populations produced estimates to 25,000 to 50,000 years ago. Those estimates have now been rejected and the consensus now is that almost all Native Americans descend from a single small group that left Asia 15,000 to 13,000 years ago, a perfect fit with Clovis First. While several possible pre-Clovis sites are compelling as individual sites, no one has formed them into a model of settlement that makes any sense. If people were here for 5,000 years before Clovis, as is often claimed, why did their numbers grow so slowly? Where is the environmental evidence for their presence? And how did Clovis spread so rapidly if the continent was already full of people? 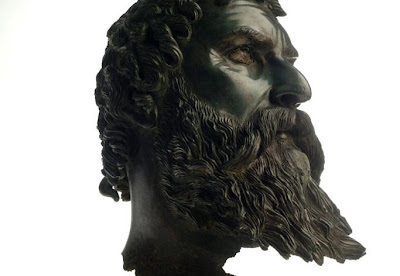 The explanatory power of the the Clovis First theory, and not some crotchety attachment to old ideas, is why many archaeologists have stuck with the model despite the growing number of sites with radiocarbon or OSL dates thousands of years earlier. With every new claim of a pre-Clovis site, the pre-Clovis gang crows to the press about the obvious truth of their view and the absurd conservatism of the Clovis First dinosaurs; this time the prize for crassness goes to James Adovasio, who told the NY Times: “The last spear carriers will die without changing their minds.” (Great idea for a Clovis First t-shirt: pictures of Clovis points under the legend "Spear Carrier.") But because Clovis First is such a powerful theory, it will take very strong evidence to overturn it, and a bunch of OSL dates with thousand-year sigmas from a stratum that looks like Clovis artifacts stomped into a muddy creek bank will not do it. In Egypt, the brief euphoria of Mubarak's ouster has faded into party bickering and shady deals. The revolution was secured by the army, but the army's leaders don't want to give up their privileged position and they want to restore order and keep the political upheaval from spilling over into social change. So it seems that they have come to an arrangement with the Muslim Brotherhood, which they used to regard as their great enemy. Their goal appears to be keeping power in the hands of conservative men and out of the hands of youthful protesters. Among other things they have agreed to a short timetable for elections. The general feeling is that holding Parliamentary elections by September will give a big advantage to the groups that already have national networks, that is, the army, Mubarak's old party, and the Egyptian Brotherhood. My Egyptian acquaintances have been passing around stories about semi-official harassment of protesters, many of whom have been picked up by "police" of some sort, roughed up, and then released with polite apologies. Nobody seems to know who, exactly, is behind this, but it fits with the notion that the army is trying to scare off radicals, limit the scope of change, and keep power in the hands of familiar actors. What will actually happen remains anybody's guess. Egypt is in many ways a conservative country, full of observant Muslims, and the long survival of Mubarak's government shows that he had strong backing from a lot of people. On the other hand Egypt also has a large number of young people energized by their recent triumph, and a pent-up desire for real change. It will be interesting to see how their Facebook/Twitter networks will measure up against the old-style networks of patronage and religion in an electoral showdown. Either way, though, what matters most is holding an election where something really is at stake. And as those of us from old democracies know, democratic elections usually have a lot more to do with party bickering and shady deals than revolutionary euphoria. 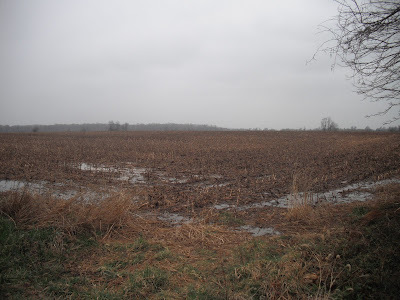 Cloudy skies over corn stubble in Delaware yesterday, where I was digging in a muddy field. It was 35 degrees in the morning, with a stiff breeze blowing from the north and a few flakes of snow falling. Michael Waters and other archaeologists have published their long-rumored findings from the banks of Buttermilk Creek in central Texas. At this site there is a strong Clovis component, the earliest universally accepted human culture in the America; Clovis dates to around 13,300 years ago. At Buttermilk Creek there is another cultural horizon beneath the Clovis material, with thousands of stone artifacts and a series of OSL dates in the range of 15,000 years. This is the best candidate for a "pre-Clovis" site I know of, and it joins several others which may be as old. 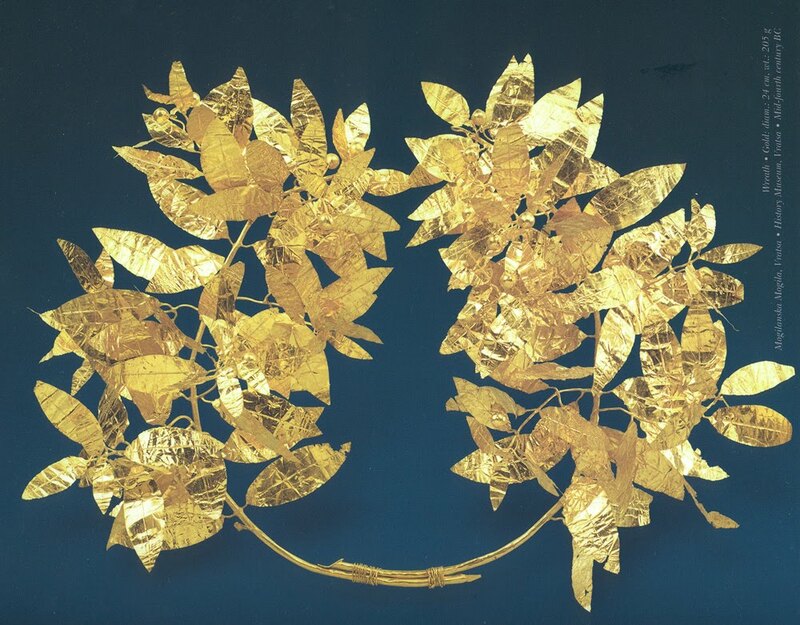 If people really were in the Americas 15,000 years ago, this raises many intriguing questions. 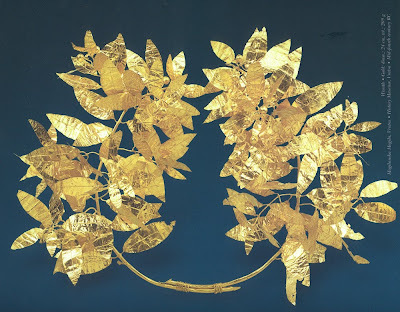 Why did their population grow so slowly that there are only a dozen or so possible sites from this period, as opposed to the thousands of Clovis finds? Why did they not have a discernible impact on the environment, in terms of extinctions and excess fires? And what about the genetic evidence suggesting that almost all Native Americans are descended from one small founder population? The idly curious should check back in about two years and see how the debate is unfolding. UPDATE: see my further thoughts on this site here. Rebel forces are detaining anyone suspected of serving or assisting the Kadafi regime, locking them up in the same prisons once used to detain and torture Kadafi's opponents. For a month, gangs of young gunmen have roamed the city, rousting Libyan blacks and immigrants from sub-Saharan Africa from their homes and holding them for interrogation as suspected mercenaries or government spies. . . . The guard turned to the reporter and said: "He lies. He's a mercenary." Since Qaddafi really is using mercenaries from sub-Saharan Africa to suppress the rebellion, for the rebels to become suspicious of blacks was probably just inevitable. But I have to wonder about the long-term prospects for a decent government in this situation. 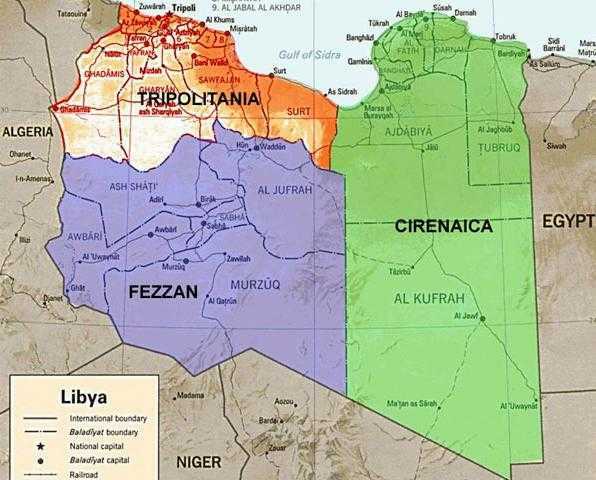 The division of Libya into Cyrenaica and Tripolitania down through the ages is no mere quirk of history. It reflects, rather, the basic physiographic character of the territory. A great natural barrier — the Gulf of Sirte [now Sidra] and the projection of Libyan desert along its 400-mile shore — divides Cyrenaica from Tripolitania, limiting communication between the two territories and to a very large extent shaping their economies. Trade between the two territories has played a minor role, and the movement of the nomadic tribes in both territories has been and remains north-south, not east-west. This provides one obvious solution to the current impasse. The mainly Shiite demonstrators moved beyond Pearl Square, taking over areas leading to the financial and diplomatic districts of the capital. They closed off streets with makeshift roadblocks and shouted slogans calling for the death of the royal family. To many around the world, the events of the past week — the arrival of 2,000 troops from Saudi Arabia and other neighbors, the declaration of martial law, the forceful clearing out of Pearl Square, the military takeover of the main hospital and then the spiteful tearing down of the Pearl monument itself — seem like the brutal work of a desperate autocracy. But for Sunnis, who make up about a third of the country’s citizenry but hold the main levers of power, it was the only choice of a country facing a rising tide of chaos that imperiled its livelihood and future. “How can we have a dialogue when they are threatening us?” Sheik Khalid bin Ahmed al-Khalifa, the foreign minister and a member of the royal family, asked Friday night at a news conference. I see the point. It seems to me, though, that the argument boils down to this: because we have so thoroughly oppressed and marginalized the Shi'ite majority, they hate us too much for us to even think of sharing power with them, so the oppression and marginalization must continue. 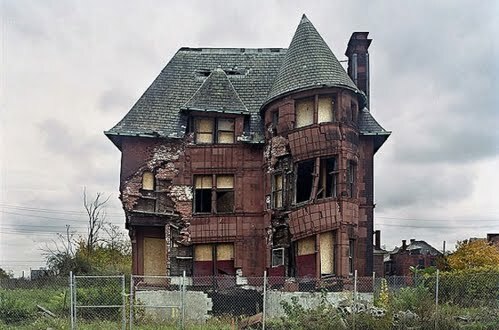 Preliminary numbers from the 2010 census show that Detroit lost 237,000 people over the past decade, 25% of its population. By comparison, New Orleans lost 29% of its population after Katrina, sometimes regarded as the worst natural catastrophe in American history; not even being submerged by the raging sea can damage a city like the industrial collapse that has hollowed out Detroit. Despite these losses Detroit still has 713,777 residents, and somehow keeping the city going to serve them is a huge challenge. More than 20 percent of the lots in the city are already vacant, and the mayor wants to demolish 10,000 more vacant buildings this year. 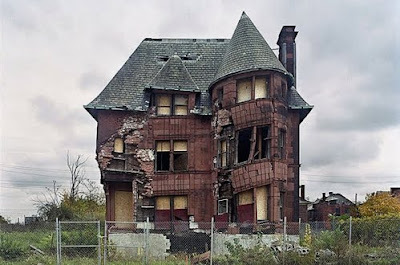 I think we should try the solution suggested by blogger Matt Yglesias, and allow 100,000 people to immigrate to the US on the condition that they live in Detroit for ten years. Hey, we may soon end up responsible for the whole population of eastern Libya; how about we resettle them in Detroit, Cleveland, Akron, and all of our other shrinking cities? Now to speake a few words more of one great mercy of God, in that he hath brought to light many witches. . . .
Like certain contemporaries of ours, the English "Witch Finder" Matthew Hopkins said he did not torture the accused witches; they were simply kept in solitary confinement, stripped, deprived of sleep, made to stand in fixed positions for hours, and questioned repeatedly until they confessed. Click on the image above to behold the truths extracted by these methods. Wallington, like most who saw the trials, watched the women come before the court and "voluntarily and without any compulsion freely declare" their crimes. He believed this was truly voluntary, as did many other witnesses. 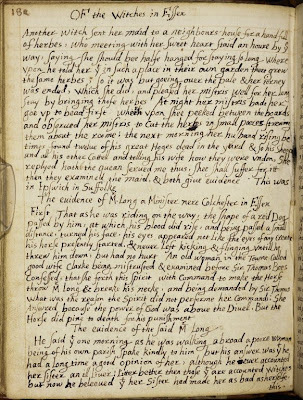 He had not seen the awful machinations of the court and did not know that the women had been told they would never escape from their questioners until they confessed to all the charges against them. A glorious spring day in Washington. The numbers for all childhood immunizations are less than zero, that is, they save more in health care spending than they cost even before you get into the question of lives saved. In general, it is very expensive to save a life by reducing our exposure to environmental toxins, compared to mechanical or medical interventions. Fireproofing the clothing of babies and toddlers is a really good idea that saves lives and pays for itself in reduced health care costs; fireproofing the clothing of children big enough to slap out small fires themselves is kind of stupid. Two notes from people who support the Libya intervention. First, they had a vote in the British House of Commons, and intervention won by 557-13. Everybody's going all wobbly over Libya, except those who never liked the idea in the first place. Tom's advice: Calm down. We have done what we set out to do in Libya. 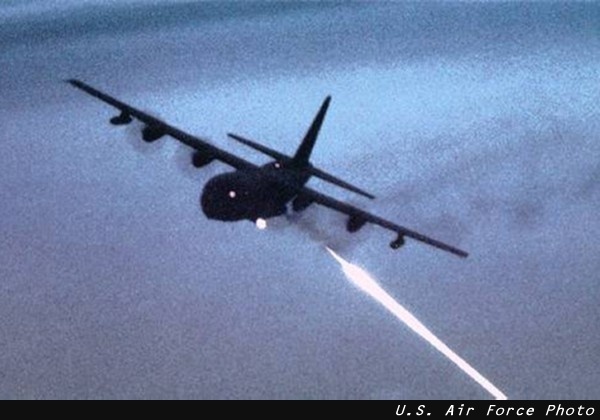 We kicked the door down, and with radars and SAM sites degraded, have made it possible for lesser air forces to patrol the skies over Qaddafi. We should now say, OK, we have created the conditions, time for you all to have the courage of your convictions. The goal now for the United States, I think, is a negative one: To not be conducting a no-fly zone over Libya 5 years or even 5 months from now. If the French and Italians want to park the good ships Charles de Gaulle and Garibaldi off the Libyan coast, good. And if the Arab states want to maintain an air cap over Benghazi, fine. Step right up, fellas. As for the American military, let's knock off the muttering in the ranks about clear goals and exit strategies. Fellas, you need to understand this is not a football game but a soccer match. For the last 10 years, our generals have talked about the need to become adaptable, to live with ambiguity. Well, this is it. The international consensus changes every day, so our operations need to change with it. Such is the nature of war, as Clausewitz reminds us. Better Obama's cautious ambiguity than Bush's false clarity. Going into Iraq, scooping up the WMD, and getting out by September 2003 -- now that was a nice clear plan. And a dangerously foolish one, too. The clearer we are now about command and control, rules of engagement and other organizational aspects of the intervention, the harder it will be to pass if off. Better they do it in their own way than we make it so they can only do it our way. I have to ask, though, what good it is going to do to "patrol the skies" over Libya once Qaddafi's troops finish crushing the rebellion. Saddam did it without planes and so can Qaddafi. 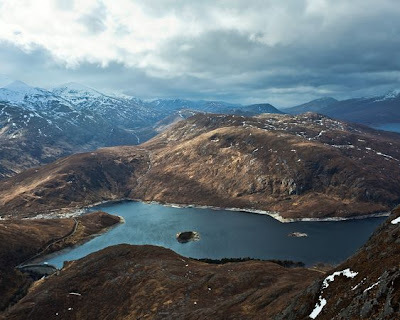 National Geographic has a nice feature on hydropower in Scotland, mostly developed in the 1940s and 1950s when very few residents of the highlands had electricity. The system includes 80 dams and 60 power stations but generates only about 10 percent of Scotland's power. Is that a small but meaningful triumph for renewable energy, or a huge assault on free-flowing rivers for a trivial return? Setbacks for rebels reveal the degree to which the disorganized and ill-equipped force is depending on allied airstrikes to end Gaddafi’s rule. Even as allied strikes hammer Gaddafi’s air defenses, his ground forces have dug in within heavily populated urban areas such as Ajdabiya, and on Monday they gained ground in the western city of Misurata. U.S. officials say the three-day-old international military intervention is intended to protect Libyan civilians, not provide support to Libya’s opposition. But Monday’s setbacks for the rebels revealed the degree to which the disorganized and ill-equipped force is depending on allied airstrikes to end Gaddafi’s 41-year rule. 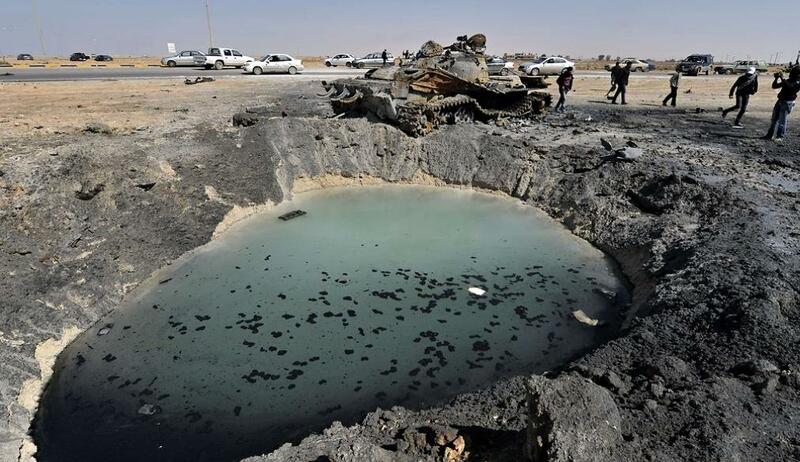 It also raised questions, so far unresolved, about how far coalition members are prepared to go to help Libya’s opposition. . . .
Top rebel officials say the internationally enforced no-fly zone has come too late to alter the military equation on the ground. Their forces, they say, are not militarily equipped to battle Gaddafi’s superior arsenal of tanks, rocket launchers and other heavy land-based weaponry. Our intervention to date has done nothing but delay the inevitable, and Obama and Clinton have both said publicly that we won't try to bomb Qaddifi out of power. So what are we doing? And why? Two new studies this week emphasize the impact that Indians have had on the American landscape. 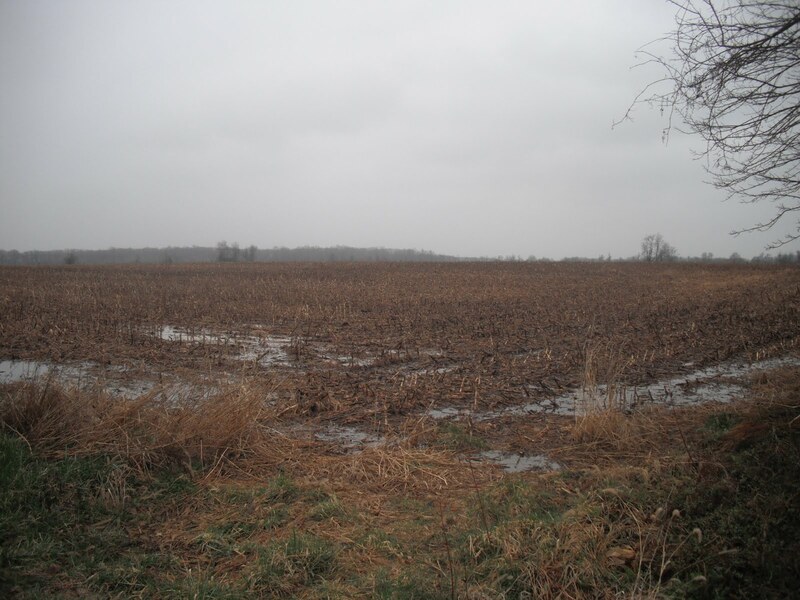 One shows that Indian farming along the Delaware River led to increased erosion of slopes and increased deposition of silt on floodplains between 700 and 1000 years ago. 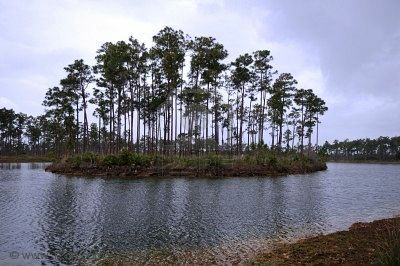 Another shows that the tree islands that dot the Everglades, known for their extraordinary biological richness and their key role in the Everglades ecosystem, formed from Indian shell middens. The middens date back as far as 5,000 years, and in some cases there is nothing left of the shells but excess carbonate in the soil. Wherever people go, we reshape the land. Sometimes this is intentional, but equally often it is an accidental byproduct of the ways we choose to live.